Irritating and unpredictable, psoriasis skin disorder is one of the most persistent and baffling skin diseases. Psoriasis is characterized by skin cells which have a multiplication rate of up to ten times faster than normal and due to the fact that the underlying cells reach the surface of the skin much faster and die, their massive volume causes red, raided plaques which are fully covered with white scales. The most common bodily areas on which psoriasis appears include the scalp, elbows and knees, yet it can also affect the soles of the feet, the palms and the torso. Crust or plaques of scales on the scalp. Disorders of the toenails and fingernails, including the pitting and discoloration of the nails. In some cases the nails may also detach from the nail bed or crumble. 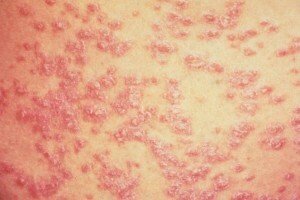 Plaques of red skin, usually covered with silver colored and loose scales. Due to the nature of these lesions, pain and itchiness are common. In some cases, they even crack and bleed, while in the severe cases the plaques of irritated skin will grow so much that they’ll merge into one another. As a result, they’ll cover large areas. In many cases psoriasis skin disease can also be easily associated with psoriatic arthritis, which generally leads to swelling and pain in the joints. According to information from the National Psoriasis Foundation, between ten to thirty percent of individuals diagnosed with the disease also suffer from psoriatic arthritis. Erythrodermic psoriasis: This form of psoriasis is characterized by shedding of scales in sheets and cyclical fiery redness of the skin. Erythrodermic psoriasis is caused by withdrawal from various medications, infections, severe sunburn and the treatment of systemic psoriasis; because of its nature it requires immediate medical attention. If it’s not provided in a certain timeframe, it may lead to severe illness. Pustular psoriasis: This type of psoriasis is characterized by scaly and red skin on the feet and\or on the hands with small pustules. Inverse psoriasis: Inverse psoriasis is characterized by shiny bright red lesions that appear in skin folds, like under the breasts, the groin area and the armpits. Everyone who is suffering from psoriasis is aware of the fact that this is a potentially disfiguring and very uncomfortable disease and it can be really frustrating and hard to treat. Over a lifetime, it comes and goes in cycles of flare-ups and remissions which cause massive psychological damage and stress. Even though there are therapies and medications that can be considered for clearing up the patches of thickened, scaly and red skin, currently there is no cure. There is also another type of psoriasis, called “guttate psoriasis” which usually starts in young adulthood or childhood and it’s characterized by tiny small spots, usually found on the limbs and torso. Triggers may be beta blocker medications, anti malarial medications, injury to the skin, stress, tonsillitis, strep throat and respiratory infections. A variety of factors have been blamed for the disease, varying from streptococcal infection to trauma and emotional stress. However, according to recent studies psoriasis is cause by an abnormality in the immune system. As much as eighty percent of individuals experiencing flare-ups have reported recent emotional trauma like the death of a loved one or a new job. The majority of medical professionals believe that these external factors act like triggers for an inherited defect in the immune system. Certain drugs and injured skin can make psoriasis worse, including ibuprofen (Motrin, Advil), blood pressure medications and Hydroxychloroquine. In general though, it seems that psoriasis runs in families, yet in some cases it may skip generations. One example is when a grandmother and her granddaughter may be affected, but the child’s father never develops the disease. While psoriasis can be embarrassing and stressful, the majority of outbreaks are normally harmless and people don’t need to worry about it too much. The good news is that people who consider appropriate treatment and also change their lifestyle and diet (which has been shown to influence psoriasis) will manage to alleviate their symptoms and lead a rather normal life.